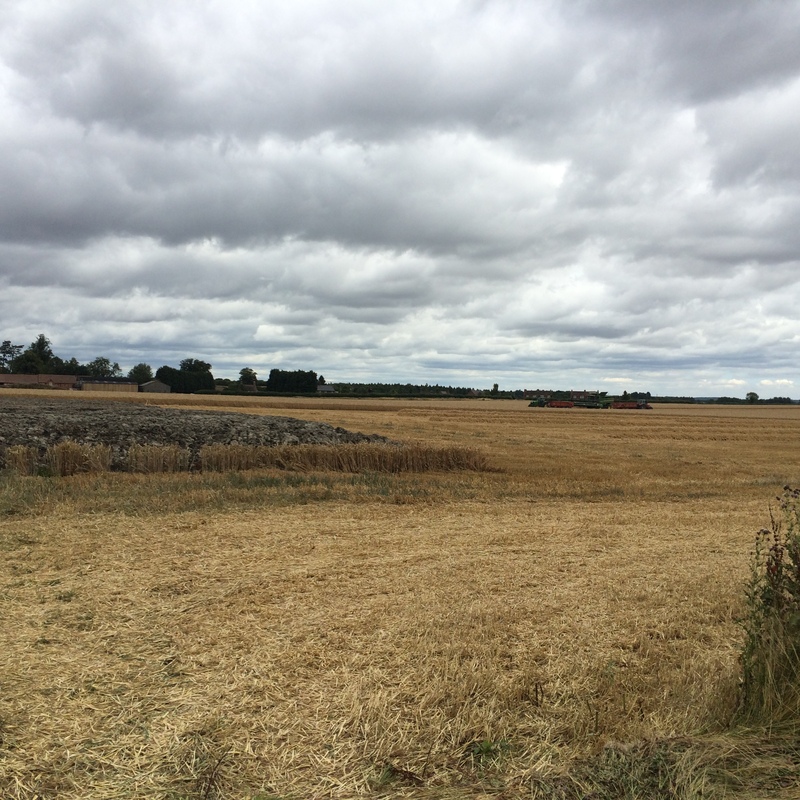 Francis & I went on a harvest cycle tour today, a few miles very locally, to see how the harvest was coming on. By giving these regular farming descriptions, I’m hoping to make the Field to Fork picture clearer. I’m glad we went today, as there’s some rain coming this week, which may pause progress. 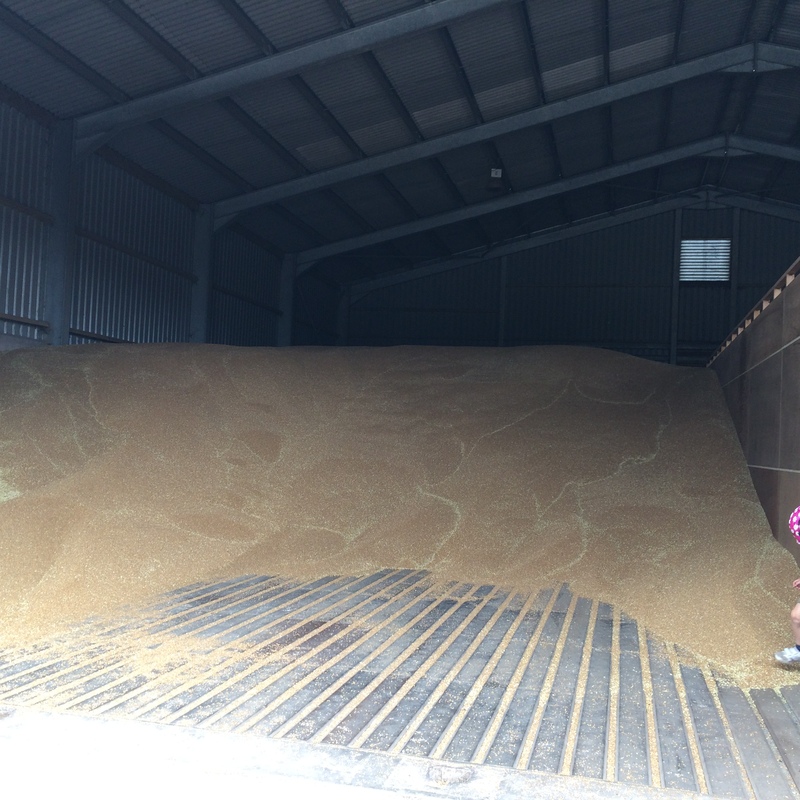 If grain is harvested when wet, it has to be dried out for longer in the grain stores, which increases electricity bills & therefore production costs. First we came to the field with a crop trial marked out with sticks which I blogged earlier this year & which is now nearly ready to harvest. When required, grain merchants ask farmers if they would be willing to test new seed grain, to test for disease resistance & productivity levels for example. 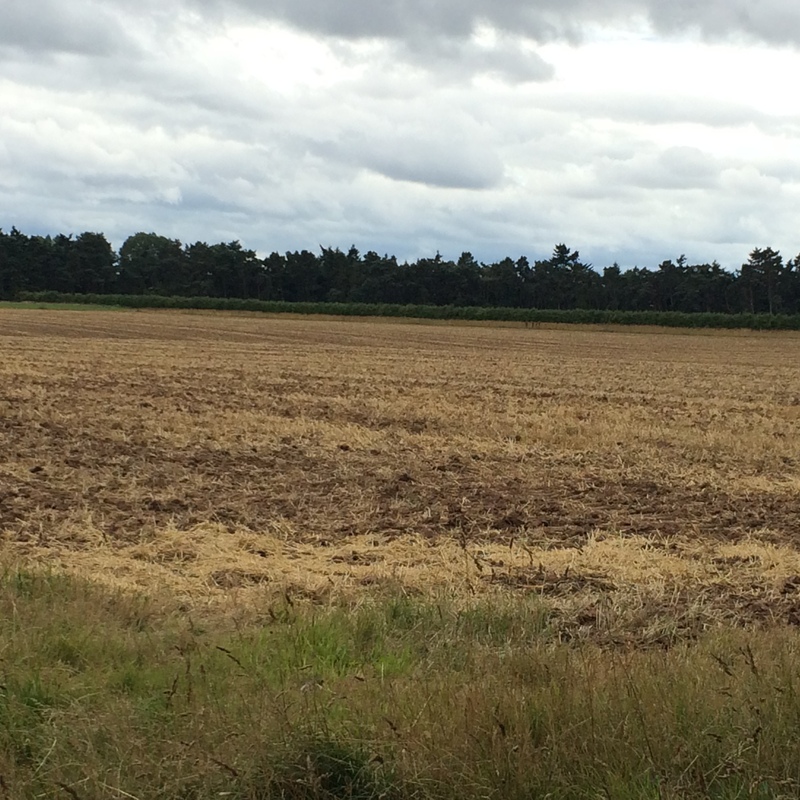 In the next field, we spotted 2 tractors & trailers & the huge John Deere combine harvester (I blogged last year’s burned out version), there’s a huge mound of sewage sludge fertiliser ready to spread immediately after harvest. 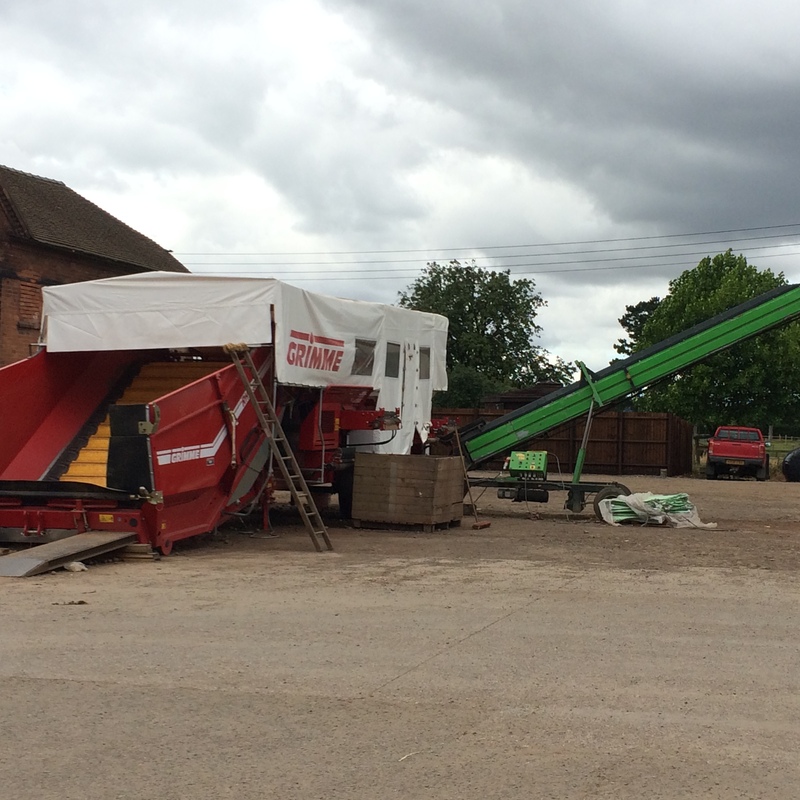 The tractors & trailers drive alongside the combine harvester to collect the grain coming out of its spout. They then take it away the grain to the grain store in the farmyard where it’s dried & stored until sold for (depending on quality) animal feed, seed or for human consumption (mainly for flour used in biscuits & bread). 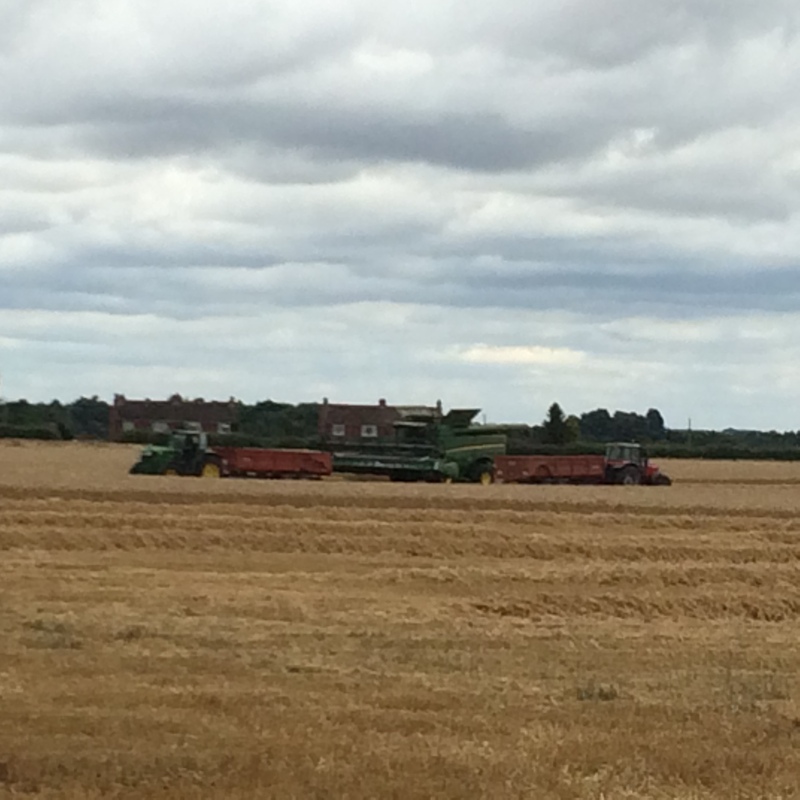 On our way home, our farming team (4 men for 2500 acres farmed in-hand) had finished combining (ie. 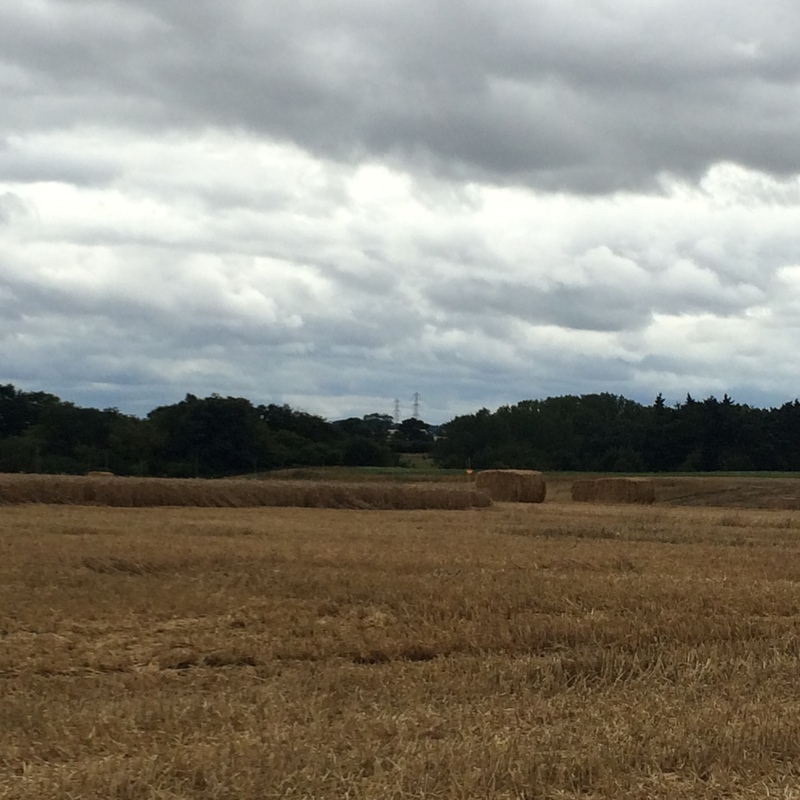 harvesting with the combine harvester), had baled the straw & had already used the disc-aerator to break up the soil to prepare the ground for next year’s crop. Min-tilling (minimal tilling (preparation) of the soil) is a farming method begun about 10 years ago which negates the need to plough & harrow the field before re-sowing it. 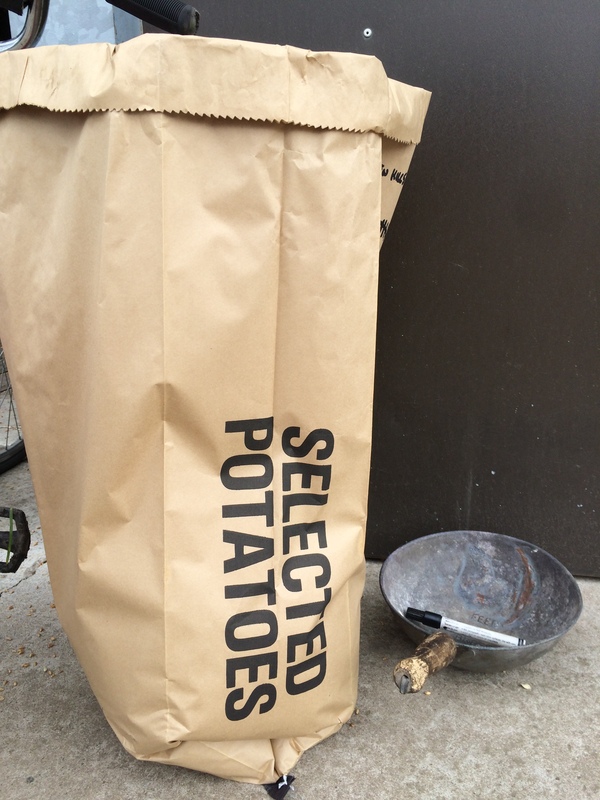 Instead, much less soil preparation is done. 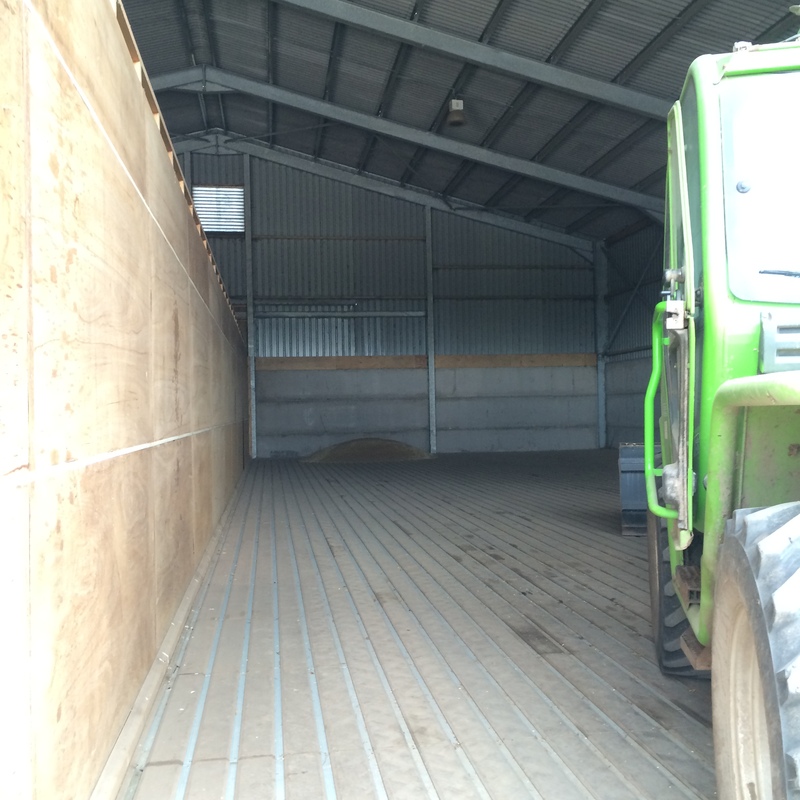 When nearly home, in the farmyard, we peeped in at grain store – one side is nearly full of wheat & the other half is empty & clean waiting for this year’s crop. Down the centre of the building is the drying mechanism which distributes hot air under the floors to thoroughly dry the grain. 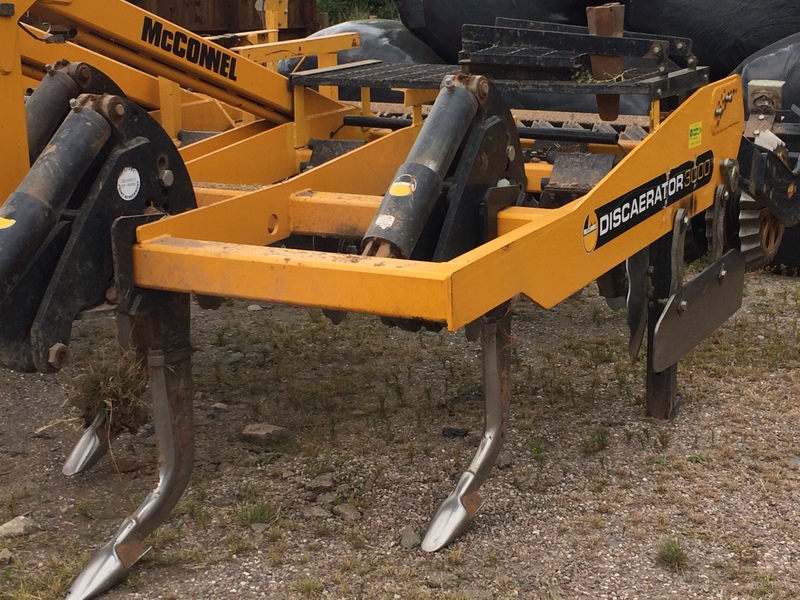 There we also spotted a contractor’s (we don’t farm potatoes ourselves) potato grader which sorts the potatoes by size. 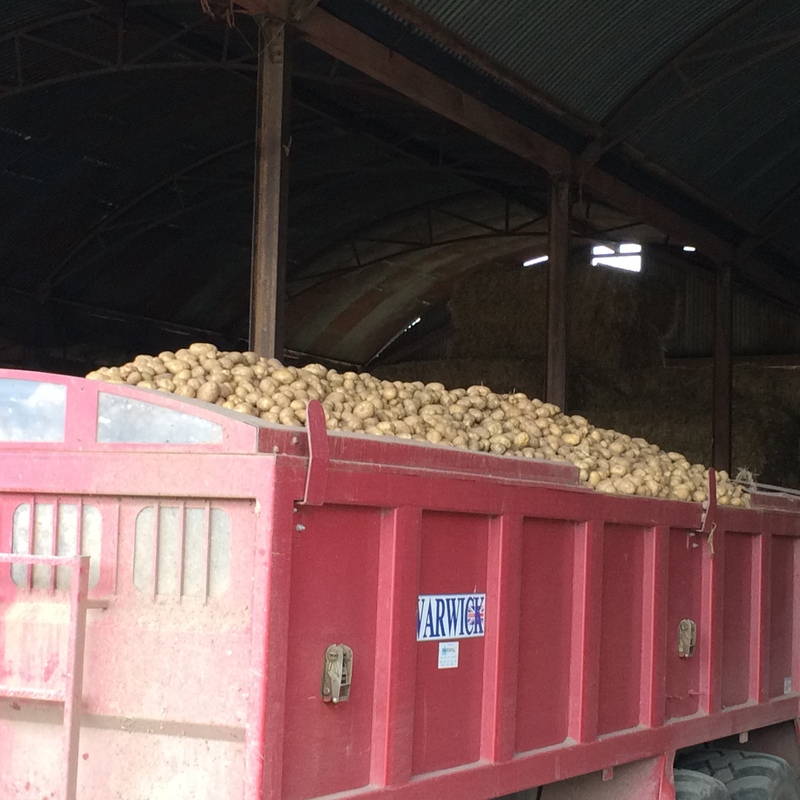 In the yard were large paper (which means they don’t go rotten as quickly) potato bags, a trailer load of potatoes & McCain [chips] crates waiting to be filled. 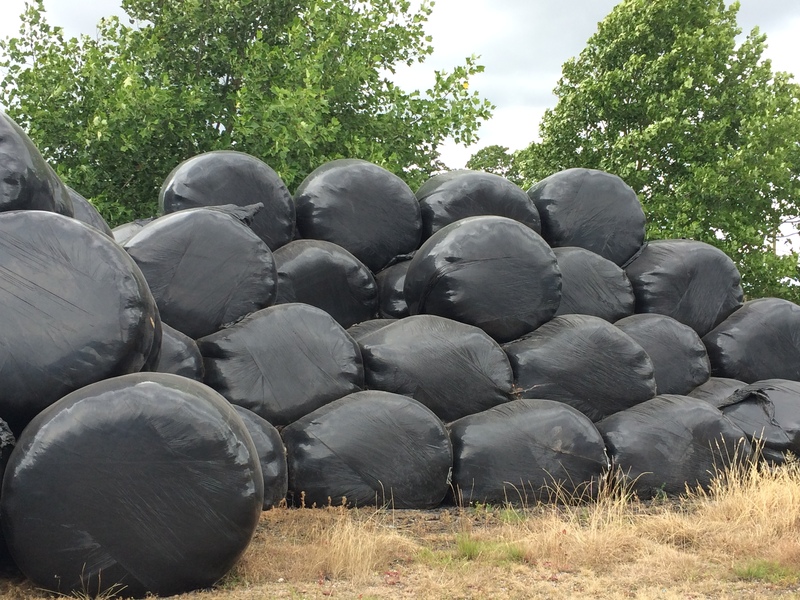 Huge black plastic covered bales of this season’s silage are piled up in the yard, ready to be fed to our beef cattle (we only farm beef cattle & arable crops) over the winter months when they’re housed in barns on beds of straw & fed silage (the fields get too wet & muddy for them).